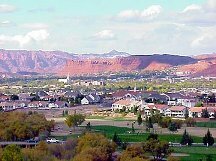 St. George, Utah has become the mid-western investiture equivalent of rustic, old, new, quaint, thriving, desert serene, red rock rim and water flowing, blunted cliff dwelling, pining away with golf, or occasional reservoir enjoying, all mixed in with roots- a flare of historic, pioneer, but community like charm. St George is located in the midst of stunning, red rock formations, rolling hills and towering Pine Valley Mountain. The peaks of Zion National Park can be seen in the distance. St. George's possible trademark is its geology (see geology section below). Some relocate here because of the lower crime rate. Others relocate here because this really is a special place grounded in pioneer history, alive with strong community values, culture and the arts and where people really are neighborly. Many have expressed the feeling of being "drawn" to this incredible area. The city is a popular retirement destination for many Utahans and is host to the largest Spring Break parties in Utah. You have come to the right place for St George area information. The kinds of people that are led to migrate to St George Utah. The unique central location between the northern and southern and mid-western united states. The unique geology and high desert scenery and land features. A few of the annual events that attract outside people and the local culture and cultural events. OK, this is the first time I've really thought about this, and I believe the first time you'll get this kind of synopsis anywhere in print, at least original formulation of thought for me after living here for 8 years, about the key ingredients that make St George a special place for relocation, if it could apply for you. OK, the first one, is the kinds of people. But I'd like to address how the first one is influenced by a couple of the other items. How we are centrally located for example. Why is that important? Well, for many it applies that they have family scattered across several geographical regions. To be more centrally located, in ones retiree years, such that more optimal visiting is enhanced, is and can be very important to a lot of people. It is not only increasingly important for retirees, but for the offspring as well, like for my family as an example. Granted it is not the single greatest factor for people, as many times visiting can be made special, not by necessarily being close. I still know a lot of retirees that flock here not necessarily based on only their kids interest, but what they can be doing for BOTH them and their kids. They see that they can do both and distance is not a factor when you have airplanes and our new St George Regional airport or a two hour trip to the Las Vegas, NV airport. But for many families that drive to see each other, this is and can be centrally located, not only for north adventures, but into the southern ones, California or what have you. Also, mid-west, like Colorado on one end and California on the other or Nevada or Arizona, kind of cross circuiting triangular area that makes St George being a not too distant place to get to. And when you speak of northern states, they all would love to get down to warmer areas either permenantly or for a second home, which makes St George not only the closest warm place for many, but close enough to drive to a second home get away for respites, vacations or for the winter, like our snow birds. 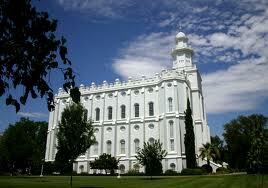 St George is located along I-15 between Las Vegas Nevada and Salt Lake City Utah. A couple events that make a great impact on the kinds of good people that come here include: The Huntsman World Senior Games and The St George Marathon. The Huntsman World Senior Games draws on Olympic sized talent from age 50+ sports enthusiasts, still bent on maintaining their own athleticism across nations and culture. This International event is meant to promote worldwide Peace, Health, Friendship and Fun! And it draws quite a crowd. The St George Marathon has been rated by Runners World as one of the four "Marathons to Build a Vacation Around". They also rated it as on of the 10 Most Scenic and Fastest Marathons as well as among the Top 20 Marathons in the USA. Aside from the almost near national park like scenery, is a definite third mention, a land feature, is St George's multitude of golf courses that promotes green scape with a major portion of the community built out around them. Not to mention is the mecca think tank of golfing enthusiasts who cross circuits, who would have many golfing friends who could also congregate "centrally" in their retiree or vacationing years. Perhaps one of the greatest trademarks of St George Utah would be its unique geological conditions and features. Picture "Snow Canyon" sprawled out at the end run of a suburb, called Santa Clara and Ivins, along out to it runs "Snow Canyon Corridor", a small miniature park like drive along a lava field floor that has spilled out into a small desert like plateau, as if a glacier had flattened its flow in the valley floor, that on your drive toward the Snow Canyon, you could "walk across lava" with your bare feet per say because of the red allure of red rock and cliffs that beckon you to come see what they hold- Snow Canyon state park. Tuacahn amphitheater, famous for its now Disney sponsored plays, brings a measure and additional touch of excitement located in a fingerling of Snow Canyon state park. All of this is on a smaller scale, but all the more attractive. Entrada of St George, one of our most exclusive of communities out here, is built up in this area. The St George Climate is just in reach to all these northerners that keep telling me on the phone, "Not one more year will I stand for this cold!" So do they talk, speak and flock. St George is building it like a field of dreams. City planners ramped up plans during one of the busiest time or our lives, between 2000 and 2006, as the U.S. Census Bureau put St George Utah as 'The Fastest Growing City" in the classification of micropolitan (under 100,000 population) areas of growth. How St George city had the money to provide for the finishing of our new airport, coming in to cover what the federal government couldn't provide as its agreed upon portion, is a miracle. We have had good city planners and many say the property taxes here are much lower than other places (approximately .6% for primary residence and 1% if it is a second home, per year). All of these things and many other local St George area attractions or cultural resources, leads to the obvious kinship St George promotes, towards a fun active adult, individual or family lifestyle and a hot spot for retirees. St George hosts many St George Retirement communities to accommodate the interest of the retiree population. I, Brian Habel, have specialized as a St George Realtor for the last 8 years in catering to this population base and interest. We are a smaller community with up and coming vacationing interest. Whether, as you can see it is a great family or individual hot spot for you, or if you are a retiree setting your sites on this area, I'd love to help you with your St George Utah Real Estate needs. St. George Utah is a city located in the southwestern part of the state of Utah, and it is the county seat of Washington County, Utah. The city is 119 miles (192 km) northeast of Las Vegas, Nevada (a little less than two hours drive), and 303 miles (488 km) or 4 hours south of Salt Lake City on Interstate 15. St George is centrally located in the mid-west of teh United States and is a hub of sorts, along the I-15 freeway, with major trucking going through it. It has been a through destination of sorts for a lot of people, who remember it and are incubating some desires and possible plans regarding retiring or relocating here. The city began booming in the mid-1980s, first as a retirement hotspot and also as a tourist gateway to Southern Utah's color country, and then as a transportation center. The neighborhoods and cities common to St George are contained in the Greater St George Area. The whole city and area is laced with St George Utah golf courses with some of them being world class. The area is known for its scenery, golf, low crime rate, pioneer history, tourism and its hospitality. There are three suburb type cities, that have grown into the fabric of Greater St George. These are Santa Clara, Ivins and Washington. Common neighborhood areas of St George are the larger subdivisions including Bloomington, Bloomington Hills, Desert Hills, Dixie Downs, Green Springs, Green Valley, Little Valley, Middleton, Red Cliffs, Snow Canyon, Sun River, Sunbrook, and Washington Fields. thoroughfares triangle-in the downtown area, namely St George Boulevard and Bluff St. Adding variety is that between the two old parts of Greater St George is the space in between downtown St George and old Washington City that contains the Strip Mall and Mall as well as the modern Home Depot, Wal Mart, Sportsman's, Costco, Best Buy and a host of others that cluster together in that same general area. St George is expected to grow into the future and as such has had the demand for larger commuter jets or planes to carry more people. Don't forget to check it all out our New St George Regional Airport! As you travel from the south toward St George, along I-15, you will go from lower lying desert terrain into higher desert, pre-mountainous terrain. St George is a desert prelude, nestled beneath Pine Valley mountain as a mixture of desert scenery, red rock cliffs, buttes, rolling hills and mountains. The terrain here follows more of the arid desert mestique, while breaking it up with some beautiful red rock features found in our local bluffs and hills. The Virgin River flows through the southern part of the city. Also, Pine Mountain is big enough to appear large in the near distance. When snow capped it really sets itself off with the white and then deeper reds at the base. This breathless scenary happens between one to two months of the year. So, come on, we'd love to have you and Brian can help you with all those St George homes for sale! St George is in high desert country. Red sandstone buttes and bluffs make up the northern part of the city. Also there are rounding hills covered with some lava rock. One of them is the site of our current airport. Don't forget to check out our New St George regional airport. The soil is of a high clay mixture with iron oxidation giving it its red color. Sandstone, limestone and some lava rock are found in abundance. St George as a city has now grown out into the mouth of Snow Canyon State Park. It is about 5 miles east involving Santa Clara and then Ivins at its base. Also at its base, and sandwiched amongst Santa Clara, Snow Canyon and Ivins is what is referred to as the Lava Fields. Some of St George's most exclusive real estate, Entrada, is parked in the middle of these lava beds, on the way out along Snow Canyon Parkway. These lava fields or lava beds seem to be one massive flow that originated up in the Snow Canyon itslef. Lava tubes (jagged small caves) can be found up in Snow Canyon state park. So, the red black and white sandstone and lava rocks of Snow Canyon State Park and the surround area's geology, create a little mecca for caving, walking, hiking, climbing, repelling and mountain biking or cycling. Two mesa's located in the St George area appear to have been lined with water or lake beds. Near one of these, the St. George Dinosaur Discovery Site has some of the oldest and best-preserved dinosaur tracks in the world. To the south of St George, the northeastern edges of the Mojave Desert are visible. Zion National Park can be seen to the east, and the mountains first and formost to include Pine Valley Mounain are nearby to the north, and rolling hills to the southeast and west. 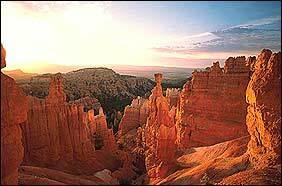 Cedar Breaks and Bryce Canyon National Park are also further north and then east. Just to the south along I-15, about 5 miles out of St George, begins a decent into the Virgin River Gorge. It is a miniature grand canyon extension containing similar geologic horizontal layers of sedimentary rock that tower just above I-15. As we begin the descent going south bound the layers are colored and more uniformly flat lying. In the middle of the gorge is the Grand Wash Fault, which forms the western boundary of the higher Colorado Plateau. It drops the rock layers downward to the west. You can see the tilt of these much older layers of limestone beds as you descend southbound out of the gorge into the nearby flat arid desert environment containing the nearby city of Mesquite Nevada. 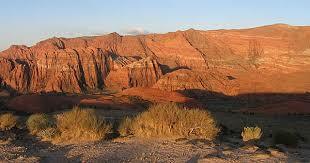 Many people may generalize the geologic attractions found near St George, to include Southern Utah color country. Maximum daily July temperatures average about 102°F (39°C). In winter, temperatures frequently drop below freezing overnight (due to radiational cooling resulting from low humidity), but temperatures warm into the 50s°F (low 10s°C) during the day. St. George averages 8.27 in (210 mm) of precipitation annually. Precipitation is fairly evenly distributed throughout the year, except for late April-June. Precipitation mostly comes from the Pineapple Express during late fall, winter, and early spring. The summer monsoon from the Gulf of California can bring localized but often intense thunderstorms from mid-July through mid-September. There has been a surge of population growth in the warmer and lower lying desert climates to the south, including Phoenix Arizona and Las Vegas, Nevada- it is thought due to retirement or mild winter climate accommodations. St George features the same advantages plus more attractive views. You do not get temperatures as sustainably high as you do in the larger cities of Arizona, like Phoenix and Mesa. Our climate is sometimes what attracts people to the area. The combination of warm dry winters and comfortable summers (low humidity) draws new residents and tourists. Some retirees talk about having better health associated with the weather. We might get a couple incidents of snow, but it does not stick around for more than a day or so, if that. The building style of St George homes are unique to the area and are largely southwest design, some pueblo and adobe. A few modern mixes exist between southwestern, Mediterranean, adobe. 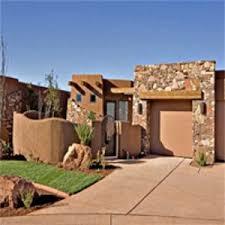 Most new homes are stucco exterior with perhaps being faced with the red rock and some hipped roof raised entry designs. Both 2 car and 3 car garage homes abound here. Desert landscaping seems to be the most popular because of low fuss and cost to maintain it in the arid and more parched desert type of dwelling. Homes with grass to abound, just perhaps not as much as those going in now or reverting to zero scape landscape maintenance. Most desert type bush or shrubs are drip fed. Various red rock finishes are typically used to cover the red dirt. Because of St George's unique mid-west and central location, and top ratings from magazines, newspapers and polls, St George Ut real estate is becoming more valuable, prized, prestigious- known to be the smart haven for many a family and retiree alike. While adult communities exist, there are probably more areas that are 'retiree neighborhood conducive' without being exclusively 55+ developments. Be sure to check out our St George Retirement Communities. The area offers many St George culture and the arts events, from the St George Musical Theater, Tuacahn Amphitheater, arts festivals and just north the world famous Shakespearean Festival. St George has many events. It is home of the St George Marathon and many more St George area events. If you need to know things like how St George schools test scores stack up against the test scores nationally or student-teacher ratios or class size, enrollment or ethnicity, our St George Schools page is comprehensive and gives some of the best outsource links available. Tourism is a fairly significant part of St George's business industry. Being along I-15, it serves either as an occasional business motel resting place or convention meeting place. A factory outlet mall and St George Boulevard see many stragglers come for the glamorizing nature of friendly St George and its unique resting and vacationing tid bits. 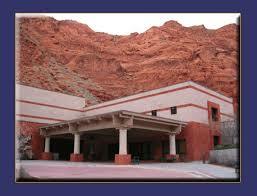 One can tour the historical monuments, hit near by Snow Canyon State Park and various other St George attractions. 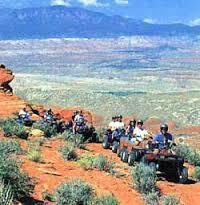 Many more vacationers know it as the gateway to Southern Utah's color country. Zion National Park and other National Parks and National Monuments spread out 40 minutes East of St George, starting from Zion (gets over 2 million visitors a year), to Bryce, to Grand Staircase, to Escalante and Capital Reef, to Lake Powell and the Canyonlands. The city is growing fast. According to the Census Bureau St. George was declared the fastest-growing metro area in the United States from the combined years from 2000 to 2006! From 1990 to 2000, St. George beat Las Vegas by 0.6% as the fastest growing metropolitan area in the U.S. The city grows at an average pace of 750 to 1,000 new residents each month. Many of these new residents are retirees who move here because of the mild winters. 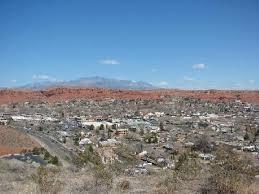 St. George, Utah has a current 2007 estimated population of 75,000 people, metropolitan wise, about 115,000 residents. The racial makeup of the city was 92.27% White, 1.64% Native American, 0.57% Asian, 0.59% Pacific Islander, 2.87% from other races, and 1.83% from two or more races. Hispanic or Latino of any race were 6.72% of the population. St. George had just 120 African Americans in the 2000 Census. The metropolitan area was tied with five other cities in having 0.3% African Americans in 2003. There are 17,367 households, out of which 34.2% have children under the age of 18 living with them, 63.6% were married couples living together, 8.6% had a female householder with no husband present, and 24.9% were non-families. 19.4% of all households were made up of individuals and 10.2% have someone living alone who is 65 years old or older. The average household size was 2.81 individuals and the average family size was 3.21. The city resident's ages are spread out, with 28.4% under the age of 18, 13.7% from 18 to 24, 22.0% from 25 to 44, 16.8% from 45 to 64, and 19.3% who were 65 years of age or older. The median age was 31 years. For every 100 females there were 94.5 males. For every 100 females age 18 and over, there were 91.2 males. The median income for a household in the city was $36,505, and the median income for a family was $41,788. Males had a median income of $31,106 versus $20,861 for females. The per capita income for the city was $17,022. About 7.4% of families and 11.6% of the population were below the poverty line, including 14.4% of those under age 18 and 4.4% of those age 65 or over. St. George is located at 37°5′43″N, 113°34′41″W (37.095279, -113.578151)GR1. According to the United States Census Bureau, the city has a total area of 168.0 km² (64.9 mi²). 166.8 km² (64.4 mi²) of it is land and 1.2 km² (0.5 mi²) of it (0.72%) is water. 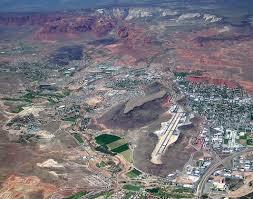 St. George lies in the lowest elevation region of the state, Dixie, with most of the city lying below 3,000 feet (900 m). FAQ - Frequently asked questions by people looking to relocate to the area. St George Ut Real Estate - to find information relating to St George including resource articles, polls, syndicate media reports, portal links, etc. Satellite Image - Google Earth mapping of St George, Utah; takes a few seconds to load & you may need to refresh to get it to out load into the larger version window pane. St George Relocation - Areas description, area resources, places to retire, employment, schools, history, relocation package, etc. Advanced Search - You mean I can just enter the house number and up pops the listing information? Yep, and much more. St George Utah has really become a great place to raise a family, invest, live or retire. Take your pick and use Brian Habel with HomeSmart Advantage- you'll be glad you did!